Dr. Robert Klein’s house is filled with model trains. They have been a passion of his since he was a 5-year-old boy. Now, the retired Akron Children’s surgeon and his wife share their love of trains each year by donating one to the annual Holiday Tree Festival. Every train they’ve donated throughout the past 25 years has been special, but this year’s carries added significance. 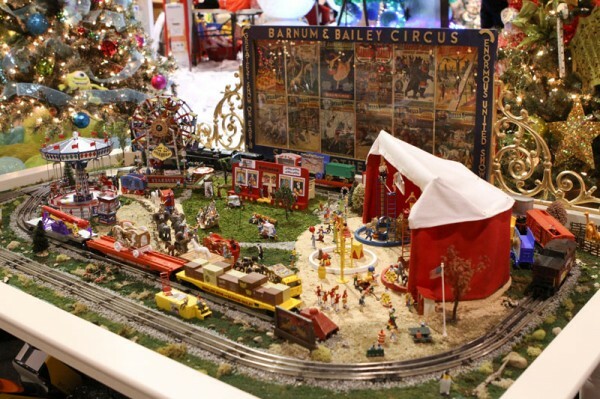 “Circus Train Model Railroad” is dedicated to the Klein’s friend, Charlie Greer, who passed away in August. As a carpenter, Greer helped create many of the train models they have donated to the Tree Festival throughout the years. A Ferris wheel and a parade of animals surround the traditional big, red circus tent, which Karen Klein sewed herself. The train has incredible detail, down to the Barnum and Bailey emblem on the side of the caboose. Dr. Klein said many people helped to create this year’s model train, including 4B Wood in Seville, Ohio, Don and Mary Jenkins, and Dave and Lori Weninger. To see this model train and other holiday creations, visit the Holiday Tree Festival, Nov. 17-25, at the John S. Knight Center. Admission is free. For more information, visit akronchildrens.org/treefestival.